Digging back into another air wing sheet, this one covers a nice selection of planes. Starting at the top is a VF-33 F-4J Phantom II. It is all done out as a CAG bird with the colors in the tail. 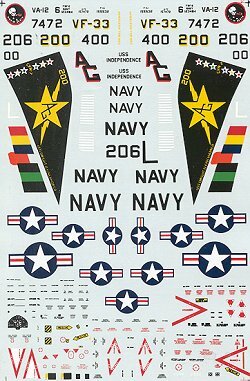 You have a variety of kits to choose from for this sheet with most heading for the Hasegawa or Fujimi F-4Js, though the Monogram kit is still very nice. Next is an F9F-2 from the Korean war in dark sea blue. You have to paint the white tail tip and the nose markings (good luck) Oddly, the sheet has many of the planes decals in black instead of the white that it should be. That means you won't be able to see them. I doubt if anyone will be doing this scheme. Finally the CAG bird from VA-12. 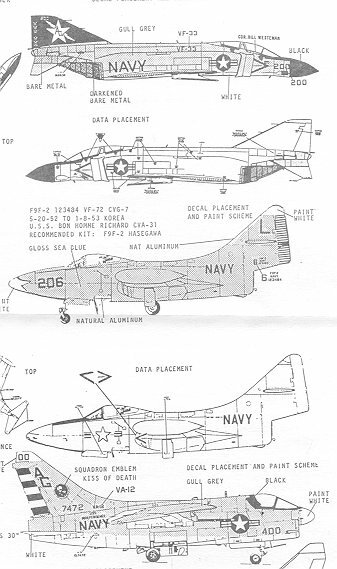 This A-7E can be done using the Airfix, ESCI, or the Fujimi kit, with the Fujimi one most desirable. This set of markings is somewhat spoiled by a gross misregistration of the orange in the rudder markings. It can be fixed, but the slip-up shouldn't have happened. Review copy courtesy of me.